Four gay couples will take part in special commitment ceremonies as part of Berkshire's first ever gay festival. 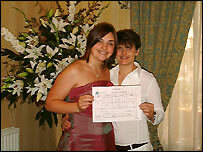 The ceremonies, similar to weddings, will be held during Reading Pride, which will take place on 4 September. One couple will be chosen by festival sponsors Pink Weddings to have special treatment including free accommodation. They have already had more than 40 entries but say they have yet to hear from any couples from Reading, which saw the event's press launch this week. Pink Weddings founder Gino Meriano told BBC News Online: "The Pride festivals are our big event, wherever they are in the UK. "It's a way of showing that we want to be accepted. A lot of couples enjoy the idea of showing commitment by being at Pride. "We have just taken it a step further by saying let's have a commitment ceremony." The winners of the ceremony, which is not legally binding, will have an official celebrant carry out the service and a song written especially for them. The free borough council-backed event - the latest to be added to the gay Pride calendar of festivals - is set to include a host of bands, performers and market stalls.